Pet stores treat animals like commodities rather than living creatures who can feel fear, happiness, and pain. Mice, hamsters, rabbits, birds, and other small animals are sold as “impulse” purchases to families, racking up big profits for stores that also supply the food, cages, and toys for these pets. Until they are sold, these defenseless animals are forced to live in unnatural, unclean, and often downright cruel conditions without veterinary care. Most of these creatures will never live outside a pet store. Not only does the pet industry contribute to animal overpopulation—it is ultimately keeping millions of cats, dogs, and other abandoned and homeless animals from being adopted into loving homes. Approximately 3-4 million cats and dogs are euthanized in animal shelters every year because there is simply nowhere for them to go. Countless sweet, loving animals can be saved if we simply say no to pet stores and breeders. Most dogs sold in pet stores come from puppy mills, where dozens of puppies are packed tightly into filthy outdoor crates. 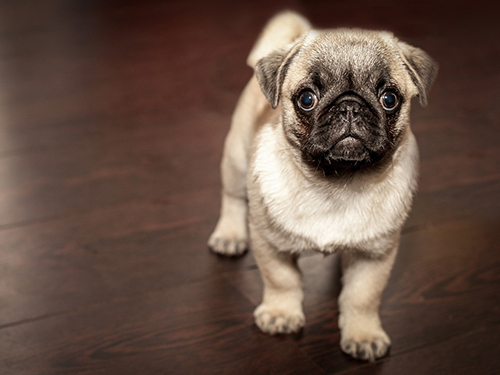 Separated from their mothers at an early age, they are often denied socialization, which is why many purebred pet store puppies are notoriously anxious and difficult to train. PETA’s disturbing undercover investigations of puppy mills have revealed the unspeakably cruel conditions that dogs and puppies are forced to endure. Animals sleep in tiny crates or cages without bedding in all weather conditions—whether it’s sweltering or freezing cold. Without veterinary care, puppies develop skin and ear infections. They are often malnourished. Adult female dogs are pregnant continuously until they can no longer breed, and then they are auctioned off or killed. They are confined and lonely for their entire lives, and they are not allowed to take care of their young. The “quantity over quality” method of breeding at puppy mills causes a host of genetic defects in these helpless animals. The most effective thing we can do to stop animal overpopulation and end this cycle of cruelty is to spay and neuter our pets—and never, ever buy an animal from a breeder or a pet store.